Just 2 miles north of Liverpool city centre, The Knowsley is within a 20-minute walk of Liverpool FC and Everton FC stadiums. The bright and airy bedrooms are simply decorated, and each has a TV. Free Wi-Fi access is available throughout, and there are plenty of shared bathroom facilities. Towels are provided in guest rooms. The Knowsley is situated in the Kirkdale area, just a 5-minute walk from Bankhall Railway Station and 10 minutes walk from Sandhills Rail Station. The famous Albert Dock and Tate Liverpool are within a 10-minute drive and Knowsley Safari Park is a 25-minute drive away. The Manor Hotel is a family run hotel providing comfortable accommodation in the vibrant city of Liverpool. 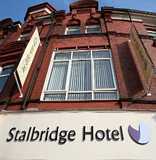 This hotel offers a warm welcome to all guests looking for reasonably priced accommodation. The rooms at the The Manor Hotel are equipped with all modern amenities necessary for a pleasant stay including TV WIFI and tea/coffee making facilities. easyHotel Liverpool is situated in the Liverpool Shopping District district in Liverpool, a 2-minute walk from Liverpool One shopping centre and a 10-minute walk from Albert Dock's waterfront. The hotel is a 3-minute walk from Liverpool St James Station. All rooms are air-conditioned, fully heated and have en-suite bathrooms. WiFi and TV are available at an additional cost, while pets are also welcome for a surcharge. easyHotels are room-only, however there is a wide range of restaurants and cafes surrounding the hotel. Directly under the hotel is an Italian restaurant who serve a mix of Venetian small plates, pastas and risottos. Liverpool's famous Cavern Club is a 3-minute walk from easyHotel Liverpool, while Royal Court Theatre is 500 metres away. The nearest airport is Liverpool John Lennon Airport, 12 km from easyHotel Liverpool. Located in Liverpool, Trivelles Liverpool offers free WiFi access.